URBACT has its HERO. 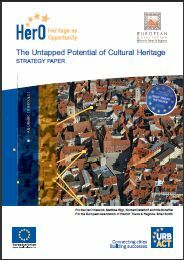 A clever name for an ambitious URBACT Project which has published a strategy paper entitled “The Untapped potential of cultural heritage – a Catalyst for Sustainable Urban Development and an Internationally Competitive Europe”. The document makes the case for a strong urban dimension as part of EU Cohesion Policy with a special focus on cultural heritage and historic urban landscapes. It calls for support and investment in integrated and sustainable urban development. The aim : to ensure Europe’s historic towns and cities are attractive places to live, work and invest in, fully able to respond to the global challenges of the 21st century and beyond. Priority should be given to securing integrated urban development with urban cultural heritage at its heart. Priority should be given to the integration of European Funding Schemes and National Funding Programs. Stronger participation and involvement of historic cities in policy development and evaluation of programs addressing cultural heritage. its great that you guys recognise that cultural potentials create global transformation we as a community based platform we request to work hand inhand with your esteemed projects to empower ouhr different beneficiaries in slums and hard to reach communities.may the lord bless your efforts towards cultuhral prosperity.